Adam does read the work of Sutter Cane and like all before him finds In the Mouth of Madness an offer too good to pass up. 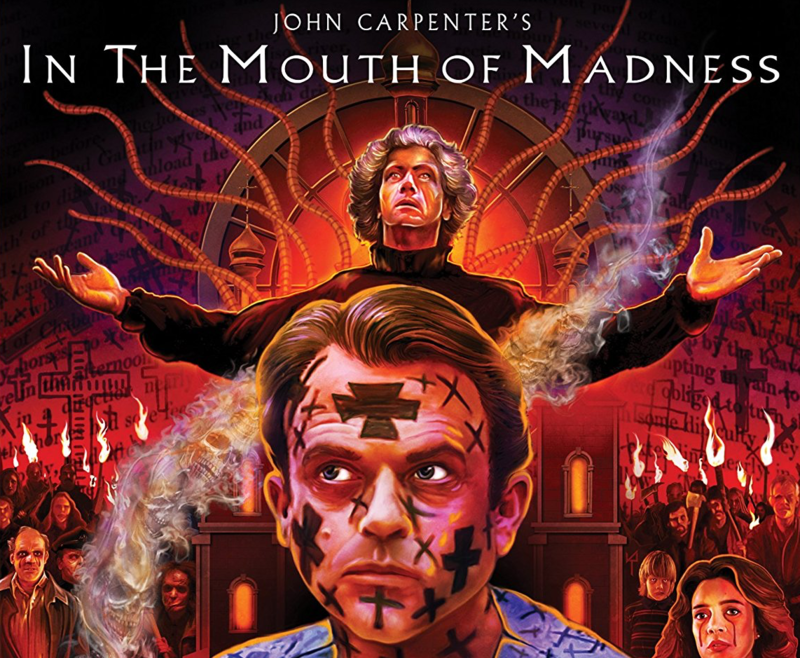 The last of John Carpenter’s Apocalypse trilogy In the Mouth of Madness like The Thing and Prince of Darkness is being released in a super deluxe edition by Scream Factory. My love and affection for the last of John Carpenter’s Apocalypse Trilogy has grown over the years sine its initial release. Much of that adoration came with my growing film and literature knowledge base. The more Noir I watched, Hardboiled Detective novels I read, Stephen King I ingested, and H.P. Lovecraft I experienced this film came beckoning. In the Mouth of Madness is all those things and more. Arcane Publishing has brought in ace insurance investigator John Trent (Sam Neill) to find the recently missing Sutter Cane (Jürgen Prochnow). Cane is Arcane’s biggest selling author. In fact, the novelist is the biggest selling author worldwide. His books causing mass hysteria in his readers, both figurative and very literal. Trent smelling a publicity stunt takes the job to find the reclusive, now missing, author. The film is fertile grounds for Carpenter who directed from a Michael De Luca script. Part of the genius of the film is that it is as much Philip Marlowe as it is Cthulhu. That perfect balance of detective fiction and supernatural horror is rare in film, something that Carpenter is an expert in. The subtle and not-so-subtle work here is as much a credit to the filmmaker as it is Sam Neill and Jürgen Prochnow. Much of the heavy lifting rests on the shoulders of Sam Neill. The star of The Possession, Jurassic Park, and Event Horizon is as committed as any actor, maybe more so. His work as Trent is both playful and serious. It’s a balancing act the actor understands better than most having worked on a slew of tricky material before this film. What we get is a fully realized character with Neill, something many others would have never approached. Many would have played the joke or make it too self-serious, never understand the joke that Carpenter is going for. Trent as a character suffers no fools, thinking there is a con behind every case he takes. Neill pushes that ethos in the character to the point of ridiculousness till the end of the film; Trent’s disbelief in the apocalypse waiting to see the strings that he never finds at the end of days. As Carpenter films go, In the Mouth of Madness sides on the more playful side of horror. A film dealing with the end of the world as we know it should not be as funny as this one is. The director’s dry wit is in full view during most of the film. There’s visual flourishes that play out for comedic and gruesome effect, sometimes in the same set piece (see the Mrs. Pickman scenes). Though not omnipresent Carpenter does manage sly jabs at the publishing world, author’s, authorship, Hollywood, and filmmaking. In the Mouth of Madness is as great a 90’s horror film as you’ll find. The film is aided greatly by having Carpenter, Neill at the top of their games. Though the least of Carpenter’s Apocalypse Trilogy its better than all (albeit one) H.P. Lovecraft inspired and adaptations. The new 4K Scan of the Original Film Elements that was done by Scream Factory/Warner Bros has resulted in a beautiful transfer. This is actually the best, barring an actual UHD Edition of the film, that we will probably see. The black levels, which is of key importance on a film that was darkly lit even during its daylight scenes, are perfect. The transfer is so good that there are key moments that played out before in darkness that this transfer now shows detail levels makes you feel like you’re watching a new film. Bravo Scream Factory for the creation of such a remarkable transfer. Of the two commentaries you’ll want to listen to the newly recorded commentary by Carpenter and producer Sandy King Carpenter. The commentary finds Carpenter in a relaxed but loquacious mood. This commentary rather than being a technical based is more antecdotal with the Carpenter’s sharing stories ranging from dishing about Chuck Heston to Howard Hawks references to Sam Neil not understand the box office juggernaut that was Jurassic Park to Hayden Christensen making an appearence in the film. Carpenter himself seems to be enjoying watching the film, even laughing a couple of times. King Carpenter manages to bring out a playful side to the director. It’s a great commentary. Also included is the original older commentary by King and Cinematographer Gary B. Kibbe. The commentary is very dry and technical focusing on the shooting of the film and the challenges inherent in the production. Note this commentary has been included on every Home Video Release since its Laser Disc debut. Horror’s Hallowed Grounds is an 13-minute installment of the on-going webseries that finds the locations from famous horror films from the past. The Whisperer Of The Dark is a 16-minute interview with lead actress Julie Carman who discusses how she got the part (it was through Sandy King who had worked with her on a TV movie), production and working with Carpenter. It’s a fun interview. Home Movies From Hobb’s End is 3-minutes of B-Roll footage. It’s a fascinating look behind-the-scenes of the various makeup effects that were done on-set. Though only 3-minutes its as good as anything on the disc. Greg Nicotero’s Things In The Basement is a 16-minute interview with Nicotero on the work that KNB did for the film. Nicotero is a great interview as he discusses the challenges of making impressive make-up effects on a limited budget for only their second collaboration with Carpenter. What’s become one of my favorite pieces of these Scream Factory collector’s edition are the vintage featurettes, TV Spots and Trailers they managed to find. This edition does not disappoint as they include all three. The best of course is the 90’s flavored behind-the-scenes featurette that even includes the deep-voiced Trailer Guy doing the narration. All great cheeky fun! In the Mouth of Madness is one of the truly forgotten great Carpenter entries. This loaded Collector’s Edition should solve that problem with Carpenter and non-Carpenter fans alike. HIGHLY RECOMMENDED!! !